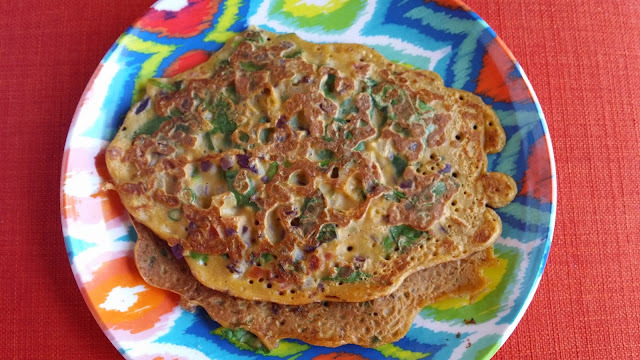 Healthy Spinach & Oats Crepes/Chila is a healthy twist to an Indian breakfast. It’s got oats & spinach, is very flavorful & can be prepared within minutes. Since yesterday I was contemplating what I should make for breakfast. The only criteria I had in mind was that it should be healthy. Of all the options I had, besan chila stood out for me this time. I wanted to make it. But how do I make the traditional besan chila more healthy? I came up with this recipe. A little bit of mix and match..and voila!! , add all the ingredients and mix well. Add water to bring it to a batter consistency. like a dosa and cook evenly on both sides. Enjoy your healthy chilas guilt free as it is or with some tomato sauce/green chutney.